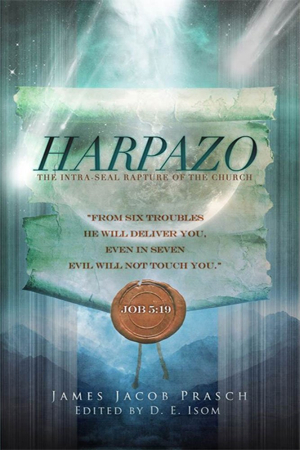 HARPAZO The Intra-Seal Rapture of the Church. Overview! And the fig tree is in blossom! Time is running out, make sure you point of departure is correct! Jacob’s latest book, titled “HARPAZO: The Intra-Seal Rapture of the Church” has been a work in progress for more than three years. It is no secret that Jacob’s technology and typing skills are so marginal that it gives us hope that he’s human after all, so we have come up with a system tailored to Jacob’s needs when it comes to writing his books, mainly that he temporarily relocates to my town for weeks at a time, literally dictating every word of every chapter to my furiously little typing fingers. Many within Moriel have expressed their envy that I have been present for every word, version and associated discussion that has gone into The Dilemma of Laodicea,Shadows of the Beast, and now Harpazo. As Jacob’s “stenographer”, so to speak, I have derived more benefit from this process than anyone else by literally typing and copy-editing these manuscripts over and over again. So I thought that those who are most familiar with Jacob’s teachings may appreciate an insider’s view of some of the things to expect from his latest and much anticipated work. From the very outset, we purposely decided not to write this book using the usual format which it seems nearly all works on eschatology employ. Typically such books spend far too much of their time reviewing the eschatologies which its author does not support and devotes a tremendous amount of textual real estate in refutation of those things belonging to those “isms” which he/she does not believe to begin with. The reader is most often guided through an almost endless referral to various charts of competing views, not to mention having to know each eschatology well enough to set them apart from each other where appropriate, and at the same time understand how to keep them in alignment when they are congruous with the author’s particular view. An example I often cite is Marv Rosenthal’s Pre-Wrath Rapture of the Church, a seminal work on the Pre-Wrath position originally published in 1990. If it were pared down to contain just those pages exclusively devoted to the author’s eschatology, the book would probably only be about a third of its current size. This is typical of most treatments of eschatology.Frankly, it is an overall bad teaching technique to focus more on what one does not believe versus what they do, and can probably be successfully argued that this is not a great approach if one’s goal is more oriented toward Bible exposition and discipleship. So we decided from the outset that the book would be written in two “halves”: the first half would be something akin to someone sitting down across the table from Jacob as he opens his Bible and simply teaches the doctrine of the Harpazo and Resurrection, completely focused on explaining Scripture; the second half would be devoted to a more academic refutation of the various competing eschatologies and address the more technical issues which are more the domain of scholars, scribes and professional critics. The problem is that as the first “half” of the book began to exceed 500 pages, we saw how unrealistic it would be to include a second “half” which would have required publishing something like a “Volume 1, 2 & 3” in order to avoid a single 1,000 page book. And would such a voluminous work actually provide the benefits we wanted to impart of plain Bible teaching? Jacob is considering following up with a book specifically addressing the academic and scholarly perspectives most often associated with seminary-level and above discussions, but such will not be found in this book. While there are occasional and sparse references to these positions and the technical terms most associated with eschatology, they are very scarce overall. In fact, we are most proud of the fact that this may be very first book on eschatology ever which has absolutely no charts and is written for the benefit of the average believer, not the so-called expert. Every eschatology is first and foremost defined by its proposed timing of the Rapture in relationship to the Tribulation. We will find individual exceptions and nuanced positions, but in general, “Pre-Tribulationism” believes the Harpazo takes place before the entire final seven-year Tribulation, “Post-Tribulationism” asserts it occurs at theend (most usually transitioning from the Tribulation to the Millennial Reign), and “Pre-Wrath” that it takes place between the 6th and 7th seals. Eschatology books still give a passing nod to “Mid-Tribulationism” which believes it takes place at the exact midway point, but in truth it’s been a very long time since I met anyone actually holding this position, as they mostly seem to have migrated to the “Pre-Wrath” camp. Many of you familiar with Jacob’s teaching, as you read the above, may have nodded your head knowingly with the notion that Jacob teaches the Pre-Wrath position. Actually, he does not. The problem is that while the timing of the Rapture is the major defining event which gives each position their name, there are many, many, manyother End Times events beside the timing of the Rapture which they all define differently. While Jacob is in fundamental agreement with the Pre-Wrath position as to its definition of “the day of the Lord” and the placement of the timing of the Harpazo between the 6th and 7th seal, there are a significant number of Pre-Wrath interpretations on a wide variety of other things with which he does not, and some of them result in important doctrinal distinctions. As Jacob overtly states more than once in the book, he shares common points of agreement to a degree with brethren holding each of these competing views, but at the same time experiences disagreement on many other issues, and such sometimes matter significantly to the point of shaping other areas of doctrine and theology. Eschatology is not only limited to the timing of the Rapture but embraces many related issues and events as well. For instance, as but one example, while Jacob provides that the Restrainer of 2 Thessalonians 2 is the Holy Spirit, it’s hard to find Pre-Wrath advocates who do not alternatively maintain that this is instead the archangel Michael. In other words, because of a large attraction to the Pre-Wrath position by many holding to Cessationism, there is a fundamental dissimilarity in theology when it comes to the Holy Spirit which, in our opinion, is no small thing. Likewise, there are those subscribing to other eschatologies who affirm that the Restrainer is the Holy Spirit, who subsequently speak of the Holy Spirit “returning” to heaven (which is impossible for a member of the Godhead) and yet asserting that in the Holy Spirit’s absence there will be those who somehow get saved without Him. This is but one example where a position on eschatology undermines the more fundamental doctrines associated with pneumatology (the Holy Spirit) and soteriology (salvation). So the intention of identifying the book as “Intra-Seal” is to call attention not just to the sole, singular issue of where the timing of the Harpazo falls within Jacob’s overall teaching, but to serve as a platform to establish the scriptural basis for all the elements related to the doctrine of the Harpazo and Resurrection, or more specifically what Scripture refers to as the “Parousia”—Christ’s appearing wherein “anastasia” (“resurrection”) of those asleep in Christ and “harpazo” of those alive at the time equals “episunagoge”—our gathering together with Him. If the only thing each eschatology addressed was the timing of the Harpazo, it would make the overall discussion much easier, but the fact is that each view proceeds from there to engage contrasting interpretations not just of the identity of the Restrainer, but of nearly every element of the Last Days such as the Two Witnesses, the role of Israel, the 144,000, the identity of the Antichrist, and on and on and on. Those familiar with Jacob’s teachings on the Harpazo have long known Jacob’s position that the Harpazo takes places between the 6th and 7th seals, the 7th seal being the initiation of what Scripture prolifically describes as the onset of “the day of the Lord”. Jacob selected Job 5:19 as the main theme for the book because it describes the fact that the seals are very different in character and execution from the trumpet and bowl judgments unleashed by the 7th seal. The “six troubles” of the first six seals are judgments which everyone on earth experiences, believer and non-believer alike, all replaying the same kinds of judgments used by God repeatedly in the Old Testament for everyone. With the trumpet and bowl judgments, however, these all come about through angelic agency through divine direction and are no longer judgments to get mankind’s attention and possibly turn us back to Him, but become the wrath of God poured out on the kingdom of Antichrist. From this point on, things are very, very different both spiritually and doctrinally. While one popular eschatology asserts believers will escape all the seal judgments and the whole of Revelation, another asserts we will go through the entire thing, but in yet another a distinction is made within the overall sequence between “judgment” and “wrath”. Here is but one example of what results from different interpretations of the biblical term “the day of the Lord”. There is near universal agreement that this describes the final outpouring of God’s wrath, and that Scripture specifically promises that although believers will be judged they will never experience wrath, but great disagreement as to when “the day of the Lord” takes place as well as its overall definition. In this case, Pre-Trib insists that the whole final seven years and “the day of the Lord” are the exact, same thing while both Pre-Wrath and Intra-Seal see the 6th seal (Rev. 6:12-17) as literally fulfilling the oft-repeated descriptions in Scripture of what takes place on “the day of the Lord”. This is no small point of difference. But this is but the beginning. The fact is that each major side brings to the table certain presuppositions which we cannot confirm when examining them on the sole basis of Scripture alone, especially as they are taught in the many types and patterns of these things provided throughout the whole of God’s Word. As Jacob has often stated and does so again repeatedly in this book, type and pattern can only illuminate doctrine, it can never serve as the basis for it. But Scripture has much to teach not just about how the Harpazo will take shape and be executed, but of the greater doctrinal purposes behind it. Even those familiar with Jacob’s teachings are going to encounter quite a bit of material in these examples they have not heard him exegete previously in this sizable list of examples. The middle section of the book contains some titles very familiar to long-time followers of Jacob’s teachings, but there are also things never previously and formally taught. 17 • What is “The Day of the Lord”? While there is new material interspersed throughout, entirely new ground is covered where interludes and the Two Witnesses are concerned. It is very enlightening to understand the important scriptural connection between particular things which some might say, at least initially, do not have a direct bearing on the Harpazo, but most certainly and exegetically do. This last section concentrates on the event itself and where it falls within the overall eschaton. One of the biggest points of contention in the field of eschatology is called by many the “Doctrine of Immanency”, and one of the most significant chapters in this book is Jacob’s exposition of 1 & 2 Thessalonians to show, exegetically, that one of the biggest problems associated with the Last Days is a prevailing false doctrine of immanency. This final section, as well, is filled with material Jacob has not directly covered in previously published sermons. At the risk of launching into a full-blown sermon, I am going to pass along what I believe to be the most important and lasting lessons I’ve taken away from these past three years’ of work, and that has to do with hermeneutics. In researching all of the alternative positions and measuring Jacob’s interpretations against those arrived at by others, I kept coming back to the question, “Why does everyone seem to be wrong at some point? Why are Bible expositors who are right when it comes to most other doctrines so askew when it comes to eschatology?” I have come to believe that one of two things most commonly take place: errors come from so-called “experts” who have never really taught the whole Word of God but make an attempt to specialize only in certain aspects of prophecy, or those who are regular preachers of God’s Word who make exceptions to their own rules when it comes to prophecy. I believe that those within the Church who will take issue with Jacob over this book will try to make the argument about his hermeneutics, claiming that Scripture cannot be interpreted this way. In fact, we should all be prepared to hear this coming from many who have shared the teaching platform with Jacob over the years, and not just the usual suspects who are always antagonistic. There is going to be those who previously held Jacob’s hermeneutics in high regard when it came to non-eschatology teachings such as “Kashrut and Famine”, “The Rite of Ordeal”, “Simchat Torah”, or many other such signature sermons. But all of the sudden those who approved of previously of Jacob’s handling of Scripture are going to cry, “Foul!” when it comes to this book, because they themselves suffer from the problems I just identified most often having to do with changing their own hermeneutics when it comes to eschatology. They would never handle the Greek in the way for which they make an exception when it comes to an End Times interpretation, they would never normally lift a verse out of context in such an egregious manner, they would normally be able to identify when a presupposition is reading into Scripture (eisegesis) instead of drawing out what is actually there (exegesis), and a number of other similar things. Although they approved of Jacob’s hermeneutics in other areas of theology in the past, they will now make an exception for eschatology because they are in the habit of making such exceptions themselves. I consider this to have been my most important function, to constantly test Jacob’s hermeneutics to verify their consistency not only where eschatology is concerned, but that there is no conflict with any other teaching in which he has employed them. Regular readers and listeners of Jacob’s sermons are going to feel very comfortable with the book, but I predict angst, particularly among the “scholars” and self-proclaimed “experts” whose handling of Scripture overall is often found to be irregular at best. However, to drill down ever more specifically, this was a great, multi-year exercise reaffirming the right hermeneutic where synonyms are concerned. Human writers know that they will lose a reader’s attention if they keep using the same word or phrase over and over again. The great writers make a name for themselves as wordsmiths who manage the most colorful and descriptive substitutes. I would get a failing grade if I turned in to my English teacher something like, “Myreally big nose, feeling a really big itch, experienced a really big sneeze, ejecting a really big booger.” Human writers know that they have to replace all the repeated uses of “really big” with much better synonyms to keep the writing interesting. I’d get a much improved grade if I wrote, “My Pinocchio-sized nose trembled at a rumbling itch in anticipation of a hurricane-like sneeze, catapulting into space a capacious booger.” (I don’t care who you are, that’s good writing.) Because there is such an emphasis in Western churches on grammatical-historical exegesis, Scripture is often handled just like any other literature. The problem is that the Bible isn’t “any other literature”, and in particular, the Holy Spirit does not employ synonyms like this. For instance, “sin” means “to fall short of the standard”, “transgression” means “to rebel against the standard”, and “iniquity” means “to twist the standard”. These are three completely different words in the original languages that have an overall general relationship to sin, but they are describing three independent situations. The Holy Spirit did not simply get tired of overusing the word “sin” and, like a human writer, decide to change it up and occasionally switch to “transgression” or “iniquity”. Bible translators would be doing us a great injustice if they did not literally translate each word exactly as given so we can understand the right and proper context. These are not synonyms which can be exchanged at will for each other, but unique descriptions of different actions with alternate motivations. Now as Jacob has pointed out in the course of many of his sermons, when the Holy Spirit uses what appears to look like a synonym, it is actually to highlight a differentaspect of the same thing. Just as “sin”, “transgression” and “iniquity” differentiate between different actions taken toward “the standard”, an easy example to understand is when God calls His people “Israel” versus when He calls them “Jacob”. When He calls them “Jacob” in Scripture, He sees them in the character of their unsaved forefather before he wrestled with the Lord, coming into a face-to-face relationship with Him and forever changed going forward. “Jacob” is what He calls them when they act in the character of the backslidden conniver; “Israel” is used when they act as the saved person who has come into a right relationship with the Lord and received a new name in the character of a regenerate believer. They both refer to the same people group, but to completely different spiritual states. The same thing occurs in Scripture when it comes to “Jerusalem” versus “Zion”; one is the corrupt earthly version of the more perfect heavenly counterpart. The point is that we cannot simply alternate between what appears to be synonyms or terms which, on the surface, appear to be addressing the same thing. The Holy Spirit is communicating something very specific and unique in each term He repeatedly inspired many authors to employ in all areas of theology including eschatology. Even before the first chapter, Jacob provides a basic definition for these terms and then builds upon it throughout the book. Scholars and experts too freely switching in and out among these terms is, I believe, at the root of so much of the theological disagreement and resultant error, not to mention all the really bad and inaccurate charts graphically depicting the eschaton. It is remarkable how often many of these terms are exchanged for one another as if they are synonyms for each other, or assumed to be equal because of the biblical use of a lunar calendar, when actually they are not. And even if they were, the Holy Spirit would still be using them to describe something spiritually unique and not merely employing synonyms which can be exchanged, one for the other. This all came about because one day, as I sat here taking Jacob’s dictation, he said something he has said a thousand times, I have said a thousand times, and probably all of us have said a thousand times: “…the 70th Week of Daniel, which is comprised of two halves of 1,260 days…” At the end of the day after Jacob left and I began to edit the text and insert the appropriate Scripture references, I went to look up the “1,260 days” in the Book of Daniel and, to my great dismay and distress, could not find it! Get your concordances out, kids, Daniel never uses either “1,260 days” nor “42 months”—they are exclusively used by John. And not only are theyexclusively found in Revelation, but it turns out they are used only for very specific things. It turns out that John only used “1,260 days” with Israel’s escape from persecution in Revelation 12:8 (the woman in the wilderness) and the Two Witnesses in Revelation 11:3; he only rendered “42 months” in conjunction with the Beast in Revelation 13:4-7 and the Times of the Gentiles trampling Jerusalem in Revelation 11:2. When I showed this to Jacob, and after he’d picked himself off the floor after realizing our mutual error of using synonyms, he immediately saw something very significant that had eluded me completely: “1,260 days” is used only with “good” guys (Israel and the Two Witnesses) whereas “42 months” is only used with “bad guys” (Antichrist and the nations). As we did further research, we quickly discovered the common teaching that “42” is the number most often associated with apostasy. It was 42 youths taunting Elisha over the rapture of Elijah whom the bears came out and snacked on, 42 places the unfaithful generation stopped at in the wilderness between Egypt and the Promised Land, 42,000 apostate Benjamites whom the whole of Israel came against and killed, 42 sons of an unfaithful king of Northern Israel whom Jehu, God’s assassin, killed. “42”, derived at by multiplying the number of man (“6”) times the number of perfection (“7”) so as to represent spiritual corruption is assigned exclusively in Revelation by John to the Antichrist and rebellious nations’ trampling of Jerusalem. There is something very spiritually significant not only when these mathematical quantities overlap and stand apart between Daniel and Revelation, but are teaching us something worth paying attention to far more than just trying to make a calendric chart of the End Times balance out. If we are going to teach an eschatology devoid of biblical error, I believe it begins by no longer treating as synonyms these terms and quantities which were never actually synonyms to start. This hermeneutic replays itself throughout Jacob’s book not just in the area of these critical terms and expressions of time, but in almost every related area over and over again, but I nonetheless embrace the notion that this is a kind of litmus test we can employ to determine who is/is not properly exegeting Scripture. Ultimately this confirms the importance of the Olivet Discourse teaching of the Parable of the Wise and Foolish Virgins. (Mt. 25:1-13) Hopefully what this book will inspire is the desperate need for each individual believer to seek an ever-deepening understanding of Scripture by the anointing of the Holy Spirit—the greater meaning to the oil in the lamps. This book is not intended to address the esoteric arguments of the scholars and scribes, but hopes to generate within each rank-and-file believer the greater need to be ever more immersed in God’s Word so that the Apokalypsis—“the unveiling” will not merely be about timing, but take root in our most basic Christian behavior. 70 weeks of Daniel, be awake, discern good and evil, get oil for your lamp, jacob Prasch, kry olie vir die lampe, laaste dae, last days, melk en vaste spyse, milk and solid food, olivet discourse, profesie, prophecy, Rapture - Wegraping, return of Christ, wees wakker, Wegraping. Bookmark.